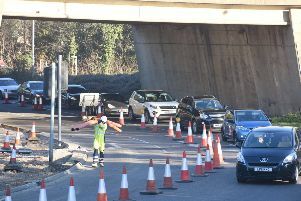 Safety works are taking place on a slip road in Peterborough this afternoon after two accidents in quick succession. Staff at Highways England have gone onto the slip road leading from the Nene Parkway onto the Fletton Parkway. Both accidents took place today (Sunday, October 14) with at least one vehicle coming off the road. The road is down to one lane while works take place.